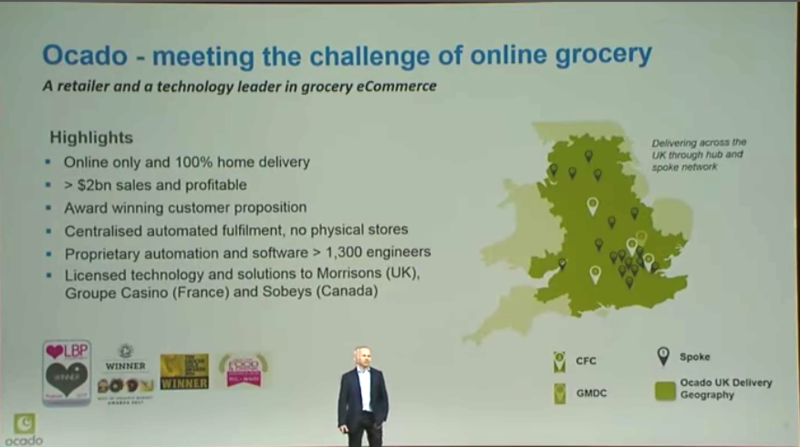 „Ocado has signed a partnership agreement with Kroger under which Ocado’s technology will be used in the US exclusively by Kroger for grocery and other food distribution related activities. The objective of this partnership is to allow Kroger to redefine the grocery customer experience in the US through the adoption of the centralised, automated model of online retailing provided by the Ocado Smart Platform. Ocado-Chef Tim Steiner hatte im März auf der Shoptalk einen fulminanten Auftritt hingelegt (siehe auch Foodkunden präferieren immer die Heimzustellung) und konnte zuletzt gleich mehrere Deals für die Ocado-Technologie zeichnen, u.a. in Kanada, Frankreich und Schweden.